Hungarian Relief Bulletin: Red Cross Staff for Refugees More than Doubled at Camp Kilmer. The trained workers were joined by many volunteers from the adjacent areas, some of them speaking fluent Hungarian. 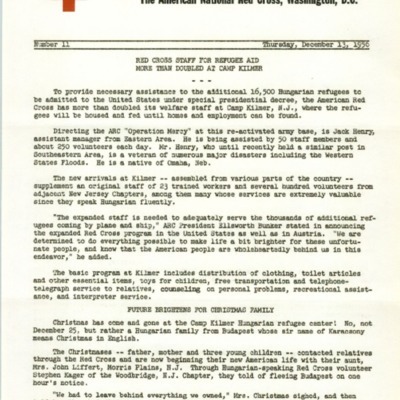 Héderváry, Claire de, “Hungarian Relief Bulletin: Red Cross Staff for Refugees More than Doubled at Camp Kilmer.,” <1956> Digitális gyűjtemény, accessed 2019. április 25., http://1956.osaarchivum.org/document/779ea9cc-8874-41b4-b2b9-ece4e2c99dca.